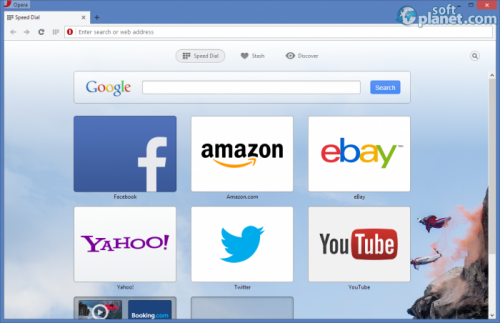 SoftPlanet makes it possible for everyone to get free Opera download directly from our servers. There is no registration needed for downloading. Opera is one of the classic web browsers the world has seen. Debuting for the first time in 1994 this browser precedes Mozilla's Firefox and Google's Chrome browsers by nearly a decade. Although it is not the world's most popular browser Opera has always had a loyal audience reaching 300 millions active users. This browser is also unique for the fact that it always presents new useful technologies and always tries to go out of the box. No wonder why it has been around for almost 20 years! In addition Opera may turn out to be a nice change when you get sick of using Internet Explorer, Firefox or Chrome. After all competition is a good thing! Opera v28.0.1750.40 features a surprisingly easy installation process. The initial setup file weighs 30.5 MB so it shouldn't be a problem for people with even slow Internet speed. When you double-click the file though the magic begins – Opera installs in just a few seconds with the installation being fully automatic; once it finishes you are good to go. True, you cannot choose the installation directory or other options but even then the install speed is amazing and worth looking into. Surprises don't end here – Opera has a very nice and intuitive user interface that is extremely easy to use. In addition you can even save entire web sites on your computer for later use and viewing – now even if your Internet access dies you can still view web content freely! The latest version of the Opera browser comes with a very minimalistic user interface that follows the latest trend when it comes to web browsers. This isn't a bad thing – you can figure it out easily, besides it offers you exactly what you need with nothing more and nothing less. You get Back, Forward and Reload buttons in the upper left corner. A Home Page button resides next to these three. 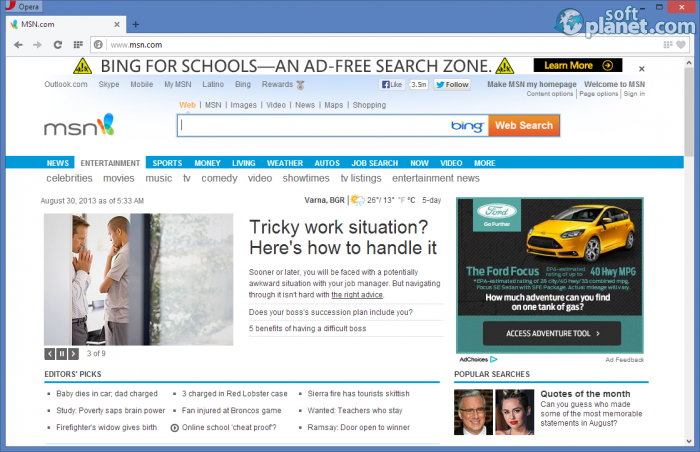 All web pages open in tabs that you can rearrange as you see fit. This version of Opera also integrates the address bar into the built-in web browser search engine just like in Google Chrome. But the most important button sits above everything in this browser – literally. You will find it in the upper left corner of the browser window – this is the place where you can manage everything – the browser tabs and settings, the downloads, the themes and more. 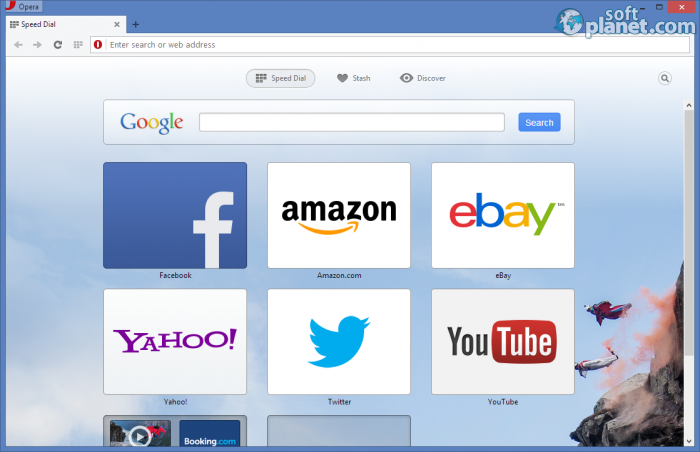 Opera 28.0.1750.40 works just like any other web browser. 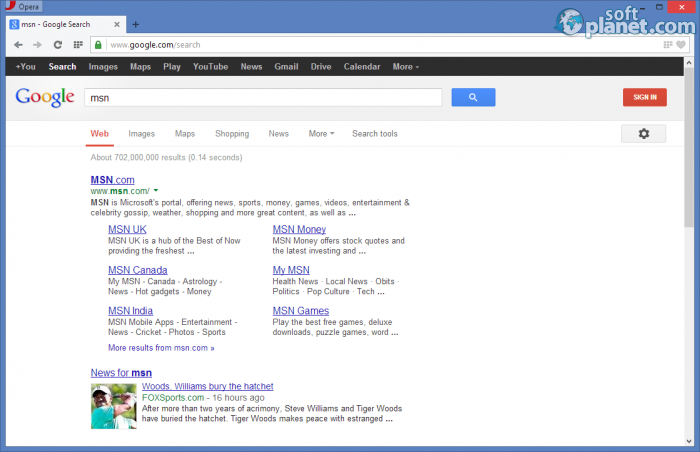 When you open it you can type a web address or use the address bar as a search engine – it is fully capable of this. You can go back and forth, bookmark pages, download stuff and more. The more advanced operations are located in the upper left corner under the button with the Opera logo – this is your management hub that allows you to change the browser settings and themes, manage the history, extensions, downloads and more. Opera 28.0.1750.40 is a well-enough known web browser. It comes with lots of fresh feature, which will facilitate web browsing even more. Despite that the app still has the old useful functionalities as well like Opera Turbo. Opera is still one of the most fastest web browsers available on the market today. It is a proper substitution for Google Chrome and Mozilla Firefox. Our security scan shows that Opera is clean from viruses. The current version of Opera has been scanned by our system, which contains 46 different anti-virus algorithms. That ensures that Opera 28.0.1750.40 is 100% safe for your computer.